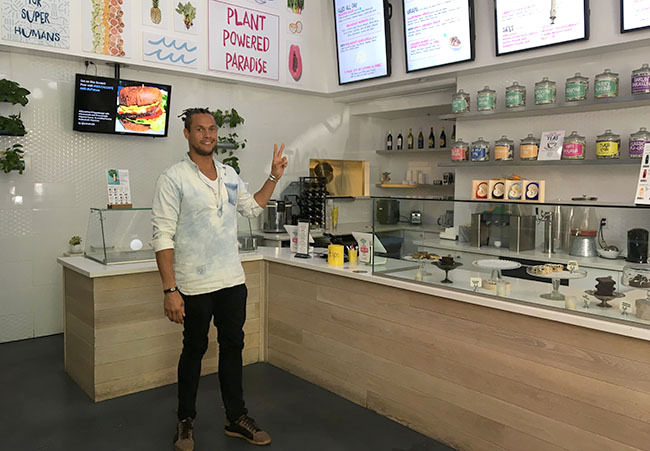 SAN DIEGO — One block past the rightfield fence at Petco Park, among craft-brew pubs and $100-a-month fitness studios, one of the newest establishments, a vegan and raw-centric cafe, thrives. On a recent Wednesday afternoon, sun bursts through open doors. A food blogger roams, snapping shots of the newly bolstered deli menu ($12.95 tuna poke bowls) as a high-def television scrolls through slideshows of the Amazon. The founder, a broad but toned man with dreadlocks wrapped in a bun and a soft chambray shirt, adjusts the potted plants affixed to the wall while keeping an eye on idle customers. “I feel like it’s taking too long,” he says. “I don’t want anyone to wait more than 10 or 15 minutes.” Slightly agitated, he scoots behind the counter to expedite, scooping seaweed salad onto a biodegradable plate. This is about as stressed as you'll find Jacob Bell these days. Between daily yoga and living along the coast, the 35-year-old embraces a lifestyle of tranquility. Sol Cal Cafe, which opened in October 2014, is his oasis. Jacob Bell was Chris Borland before Chris Borland. A left guard with the Titans, then Rams, Bell had signed a free-agent contract with Cincinnati in 2012. One month later, at age 31, he quit. Bell never put on a Bengals uniform. • MY BIG, FAT NFL CAREER: Football forced Nick Hardwick into a lifestyle of competitive eating. When he stopped playing, the pounds melted away—and so did part of his identity. In 2011, his last NFL season, Bell (No. 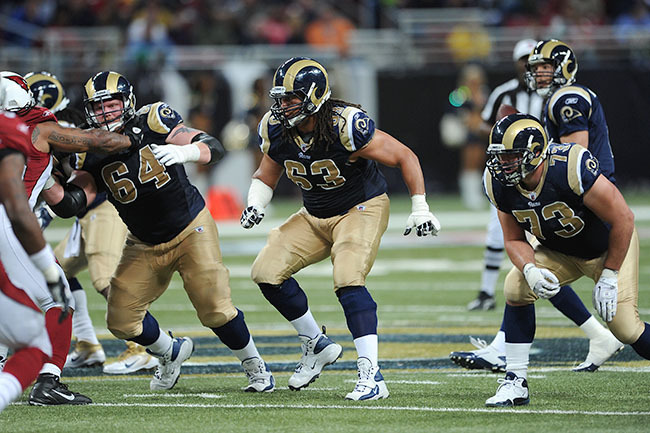 63) helped protect Sam Bradford. Bell says he had three or four documented concussions. “Everyone in the NFL is aware that what they're doing could potentially be bad for their health,” he says. “If you’re banging your head for a living, you have to figure at some point you’re going to pay for it. But I took action when a direct link became defined. There were no ifs, noes, maybes about it. The NFL was in denial about it at the time, but the news was out there.” As headlines of former player lawsuits and budding CTE research piled, Bell’s passion dwindled. Still, he signed with the Bengals in free agency; Cincinnati was a manageable drive for his family in Cleveland. He loved the camaraderie in the locker room. Bell alerted his agent, who said he needed to call Marvin Lewis. “S---,” Bell said, wary of an uncomfortable conversation. At first, Lewis tried talking his new free agent out of it. Just come to training camp, the coach said. Once you walk away it’s hard to come back. The bargaining didn’t resonate, and Lewis accepted Bell’s resignation. Bell at work in 2016. Bell was as light as 220 pounds, and now sits comfortably at 240. He boasts being in “fantastic shape” but “I’d get crushed if I lined up now.” Besides yoga, Bell enjoys cardio and high-rep, low-intensity weight classes “the type with 25 girls, two guys, and the girls are just crushing it. Like, there’s a sixth-month pregnant lady next to me, not even sweating.” He doesn’t regret leaving, but considers his alternate ending. At 35, it’s not unreasonable to think he’d be gearing up for another training camp. “I miss it,” he says, “But mostly I miss the people.” He stays in touch with a core group of ex-NFL friends. One is flying out to San Diego this week to buy his car. When he first retired, Bell considered broadcasting. He also wanted to host camps, or coach—just stay connected to the sport. Borland spent a year traveling before settling on his next move, at the Carter Center. Bell, too, needed time to breathe. Sol Cal Cafe was an organic investment, as Bell’s family ran an Italian restaurant in Cleveland and he grew up running around the kitchen (and getting kicked out by line cooks). Bell became passionate about eating clean toward the end of his playing days, and especially since moving to Southern California. When his friend saw a reasonable listing adjacent to the baseball park, the two decided it was a good investment. Running a small business has its challenges—Bell recently hired a private business coach—but plenty of rewards. This afternoon, as a steady flow of lunch-goers leaves smiling, Bell exudes calmness. The cafe uses Bell’s NFL connection in some of its marketing, and though Bell says he thinks people recognize him, they rarely say anything in the one hour a day he spends at the cafe. “It’s funny, because then I’ll go to a bar, and people with a little liquid courage will shout to me: ‘You’re the guy from SoCo!’” His new identity, it seems, is starting to stick.